Do you have kids? Maybe you don’t but do you like stuffed animals? Then you’re in luck! Build-a-bear is having a great special and you can take full advantage of it with this BUILD-A-BEARY SPECIAL OFFER COUPON. You can take $6 off the price of a stuffed bear that’s $12 or more. If you’ve ever been to build-a-bear, you know that’s epic! It doesn’t get any better than that. And with the money you will save, you can mosey on over to the clothing and pick out a cute outfit or some accessories for your bear to wear. 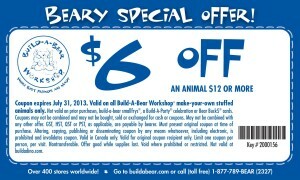 Truly, beary special. Its that time of year when all the swimsuits and everything are out and you can take your bear to get some fun in the sun and relaxation. Bears are people too, you know. Build-a-bear has been around for quite some time now and they always find a way to put a smile on someone’s face no matter what season or day it is. It’s just something about having a bear you can call your own. If you’ve never been there, it’s beary heaven! You even get to sit at the computer and name your bear. You get a bear house and birth certificate and everything! If you have some special occasions or birthday coming up, maybe this would be a great idea for you. I will have to warn you though – build-a-bear can be addictive! It’s very easy to get caught up in all the things they have to offer there. It’s truly a bear wonderland. Head on down and use your coupon and get your new family member today! 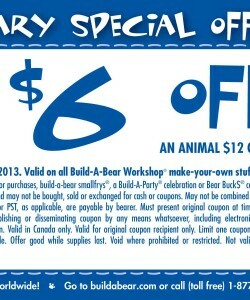 Valid on all build-a-bear workshop make-your-own stuffed animals only.